Write was built with mobile-first responsive design in mind, so it offers a pleasant reading experience on both smartphones and tablets. 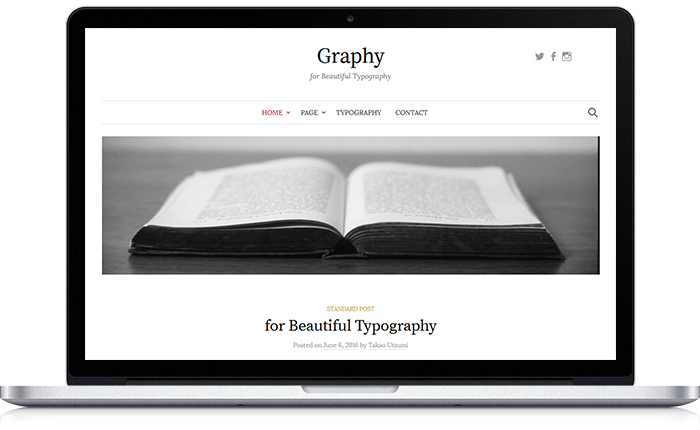 Write supports the following customization options: Colors, Logo, Header Image, and Home. 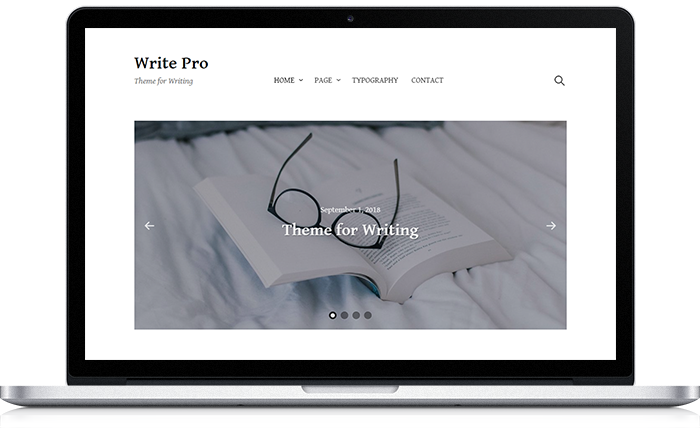 Write Pro also supports Fonts, Layout, Title, Featured Posts, Post Display, and Footer. Write supports the following widget areas: Footer Left, Footer Right 1, Footer Right 2, and Footer Right 3. Write Pro also supports Sidebar, Sticky Sidebar, and Instagram Widget. Write supports the following custom widgets: Write Profile. 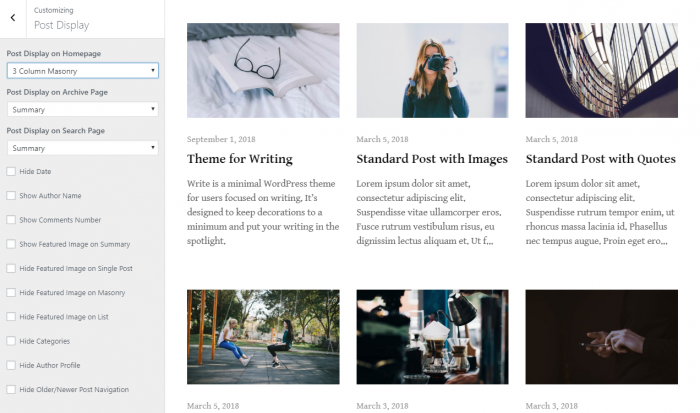 Write Pro also supports Write Featured Posts. Write supports the following menus: Main Navigation and Footer Social Links. Write Pro also supports Footer Menu. 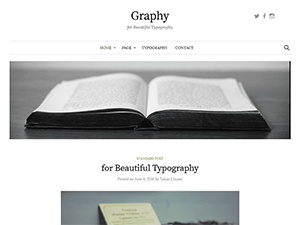 Write supports the following page templates: a Normal Page and a Full Width Page. Write Pro also supports a No Sidebar Page. Write supports multiple languages. Currently supported languages are English and Japanese. Typography has been appropriately adjusted with CSS for Japanese. 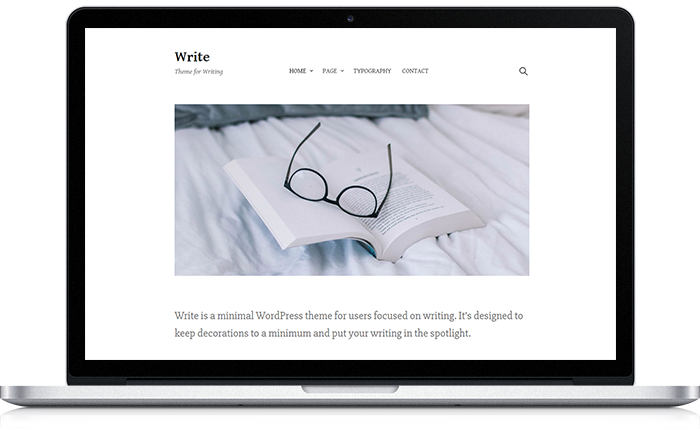 Write is made with people who want to customize its code in mind and adheres to WordPress standards while maintaining clear, readable code. With Write Pro you can set the header and body text to a variety of fonts. With Write Pro you can set the posts that will be featured on the homepage slider as well as in the Write Featured Posts widget. With Write Pro you can use Sidebar and Sticky Sidebar widget areas, so you can make two columns blog. With Write Pro you can set how posts are displayed on the blog posts index page. You can also show/hide elements such as date, author name, comments number, featured image, categories, author profile, and post navigation. 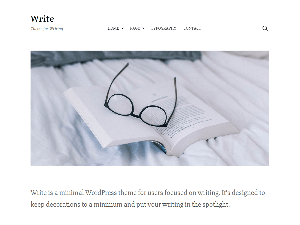 With Write Pro you can set the footer text and hide the theme credits. You can also set Footer Social Links and Footer Menu. With Write Pro you can receive 1-on-1 personal support via email. Unlike forum support, your site and support information will not be visible to other people. If you would like to use the old version of Write, please download the file from here.